Nancy Hemphill stands next to a board with photos of foster grandparents. 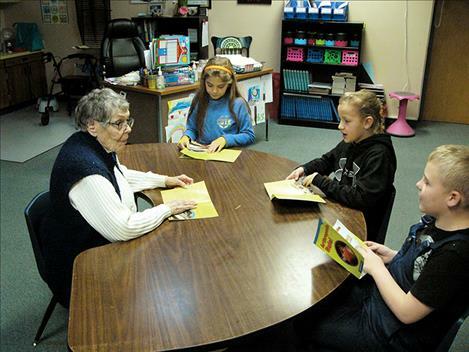 Foster grandparent Robin Burland regularly volunteers at Linderman Elementary School. Burland has said that even if the program ends, she’ll continue to come help at the school. POLSON – Although a local program that benefits seniors and children has received a number of kudos, it may fall victim to a lack of funding come July 2018, the beginning of the next fiscal year. Nancy Hemphill, the former coordinator and now director of the local Agency on Aging’s Foster Grandparent program, said the non-profit organization decided not to re-apply for a three-year grant from the federal Corporation for National and Community Service (CNCS), an AmeriCorps program. She is hopeful a new sponsor will step up to save the program, which has been in existence in western Montana since 1999. 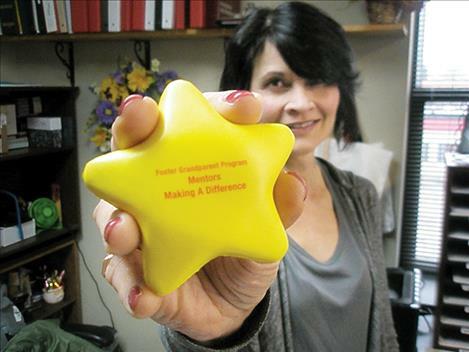 The program’s Polson office currently manages operations in six counties in the western part of the state except Missoula County, which has its own program. The grandparents are typically placed in daycares, elementary schools and Boys and Girls clubs, Hemphill said. 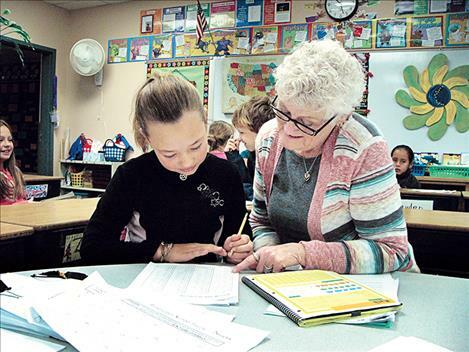 Some local locations where foster grandparents work include: Linderman, Cherry Valley and Pablo elementary schools, the Boys and Girls Club of the Flathead Reservation in Ronan and Little Lambs Preschool in Ronan. “I feel that over the last 18 years, it’s been beneficial to both the seniors and the children,” Hemphill said. 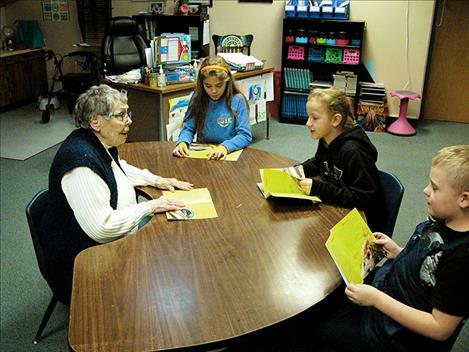 “The seniors are given a reason to get out of bed every day, and the children have the benefit of an older person who offers them unconditional acceptance, caring and love that some of them don’t get otherwise,” she said. About 50 low-income grandparents receive a small stipend that pays $2.25 an hour for 15-40 hours of work per week at 22 locations in the six-county region, she said. Hemphill recently replaced Micky Snyder as director after she left for a job at Salish Kootenai College due to the program’s future being in doubt. Snyder said the CNCS grant, which provides $231,951 per year for the Foster Grandparent and Retired Senior Volunteer programs, impacts the economy across the western part of the state. “For every dollar spent, it generates about two dollars,” she said. The Polson office of the Agency on Aging decided not to reapply for the grant – which was non-competitive as long as the agency was the awardee – because of compliance issues that resulted in the agency paying a $23,000 fine, Snyder said. The issues – which dated to over three years ago before Snyder became director – were subsequently rectified, she said. Once the grant is not renewed it becomes competitive again, Snyder said, noting that she was willing to do fundraisers to make up for the $23,000 fine in order to keep the program going. 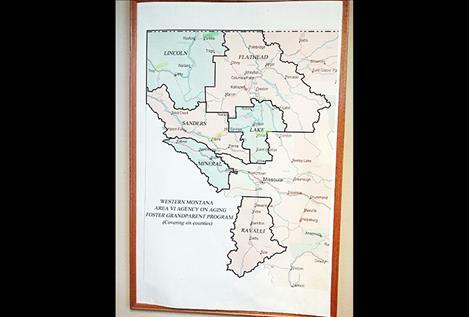 Snyder said she approached the Confederated Salish and Kootenai Tribes about either sponsoring the program for about $199,000 or applying for the grant themselves. 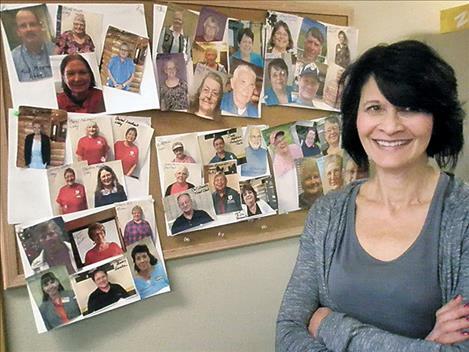 Tamara Watson, the chief executive officer for Western Montana’s Area Six Agency on Aging, said she made the decision not to re-apply for the grant in November and the regional agency’s 10-person board of directors supported her. The fine came because the agency – which was led by her predecessor at that time – used non-CNCS compliant vendors to conduct background checks, she said, noting that CNCS rules are extremely complicated. She noted that the CNCS grant requires matching funds. These totaled about $50,000 in Fiscal Year 2017, which ended June 30. Watson added that the agency offers other programs for seniors that are funded by the federal Older Americans Act of 1965, but funding has been flat for years. “We are now in a ‘Silver Tsunami’ because Baby Boomers are retiring and wanting senior services,” she said. She noted that Kalispell’s RSVP program ended about two years ago after the Agency on Aging office there got fined for a similar non-compliance issue regarding background checks. The local RSVP program, for example, hires seniors to drive county transportation buses to take seniors to various things, said Lake County Commissioner Dave Stipe, who serves on the local Agency of Aging’s board of directors. “We thought it was a really good program, but we just can’t afford to run a program that fines us that much,” he said. Hemphill’s three children all had a foster grandparent in their classes in Polson. “They don’t remember all of their teachers but they do remember their grandparent,” she said. Kristin Wilson is in her first year as principal at Linderman Elementary School in Polson, having previously been a teacher there. Wilson says she had a grandparent in her classroom for the past 10 years or more. Wilson has four grandparents in her school this year, including Pat Wenzinger, Ellie Cole, Robin Burland and Charlotte Gaustad. Wenzinger, 84, got involved in the program 10 years ago. Wenzinger’s daughter, Susan Stephan of Kalispell, told her about the program. “Teaching is my first love,” Wenzinger said, noting she studied to be a teacher for two years at Hancock College in Santa Maria, California, but had to stop. An Ohio native, Wenzinger says she has recruited two or three others into the program. She works 15 hours a week - helping students with reading, English and math, for example, and focuses on four or five students who are struggling. She also connects with all students in Jennifer Wyman’s fourth-grade class, she said. “If you are over 55 and need something to do, do it,” she said. This is the first year that Wyman has had a grandparent in one of her classes. She notes that Wenzinger helps with small group instruction, grading papers and lesson preparation. Cole works 20 hours a week for the program, which she has been doing for six years. She previously worked in daycares and with various kids’ programs. Robin Burland, 69, has been a foster grandparent for three years. “Even if this goes by the wayside, I will still come in every day,” she said.